For professional and family gathering of any kind, from meetings, to family parties, for example product launchs, staff meetings, club events, birthday parties, engagements, baptisms, holy communions etc, Bhasuri Inn offers a spacious, tastefully appointed meeting room and event space that can be customized to suit your needs up to 1000 guests. Our extensive parking lot accommodates about 60 vehicles both covered basement and open yard. We provide free limited driver accommodation. For presentations and productivity, high-speed wireless internet is available free of charge. In addition, podium, tables and seating will be provided by friendly, energetic staff in accordance with your needs and specifications. 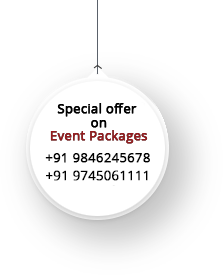 Our diligent and courteous staff will help you develop an event plan that suit your individual needs. We also provide special arrangements for delicious food at the Bhasuri Inn multi-cuisine restaurant.